Are your children at risk for developing high blood pressure? They are if they are overweight. According to the July 2005 issue of the National Institutes of Health's (NIH) News In Health, more than twice as many children are overweight now com-pared to 30 years ago. In fact, among the 6-11 age group, the number of overweight children has more than tripled. Approximately 16% of American children are currently overweight. In addition to increasing blood pressure, childhood obesity has caused a dramatic increase in Type 2 diabetes and metabolic syndrome. 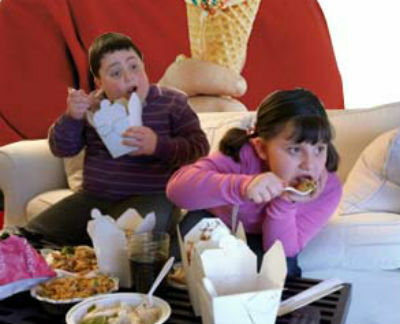 So what is causing the alarming increase in child-hood obesity? As with adult obesity the answer is a poor diet and lack of physical activity. The alarming increase has gotten the attention of our nations policy makers, as well. Beginning with the 2006 school year, federal mandates now require school systems to develop standards of nutrition and activity for all school children, and estab-lish healthy school nutrition environments. Take a close look at what your kids eat each day and then start to make gradual improvements. Kids today are eating too much high-calorie food that is low in nutritional value, so avoid French fries, hot dogs and doughnuts. Replace soda with water. Eat whole grains (whole wheat bread and pasta, brown rice, oatmeal, etc.) instead of the refined alternatives. To help your children eat an abundant variety of fruits and vegetables, serve raw veggies at snack time instead of chips or cookies. A child who initially dislikes a particular food often tries it again and likes it once it becomes a familiar offering, so continue to serve a variety of vegetables at mealtime. It is also fine to be sneaky: Add finely minced spinach, kale or broccoli to sauces, soups and stews. Start each meal with smaller portions of food and then eat slowly, while conversing. Finally, never force your children to eat everything on their plates. Instead, teach them to stop eating when full. Also, many children are spending too much time watching TV, playing video games, and surfing the internet, so limit their sed-entary activities. Encourage your kids to run around outside each day, do chores around the house and dance to music. Get them involved in a sporting activity. According to the National Institutes of Health, children should get at least 60 min-utes of moderate physical activity each day. Obese children are likely to become obese adults, so it is impor-tant to instill healthy eating and activity habits early on. In addi-tion to your child's healthy diet and activity level, having their nervous system checked for interference is another important piece of your family wellness program. A healthy functioning nervous system will ensure that your child receives the maxi-mum benefit from their healthy diet and activity as they grow.